In a Pharmaceutical Setting, the role of a Certified Pharmacy Technician is vital, as these techs are responsible for processing and filling prescriptions under the direction of Pharmacists. The job duties normally mentioned on the Certified Pharmacy Technician Resume include these – preparation of medicines for patients, receiving and verifying prescriptions, sterilizing surfaces and equipment, processing prescriptions electronically, selecting appropriate medicine and measure dosages, executing administrative tasks, stocking and pricing inventory of medications, and maintaining pharmacy safety by adhering to infection-control. 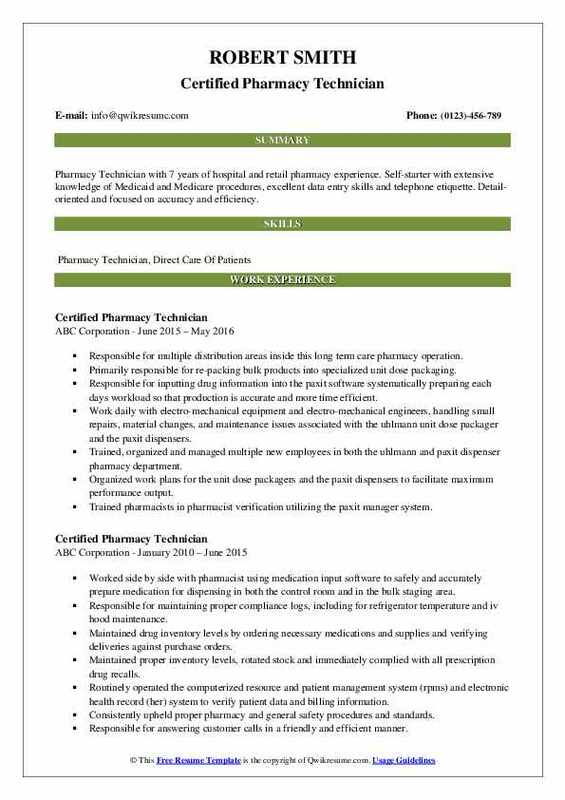 As a Certified Pharmacy Technicians, these skills will be expected of you – proven work experience, knowledge of various online prescription systems, a thorough knowledge of pharmacy law and medical terminologies, strong communication skills, and the ability to adhere to security measures and quality standards. Completion of Pharmacy training program is mandatory; while, a certified Pharmacy Technician will be an asset. Headline : I have worked in pharmacies for over nine years and have gained extensive experience in pharmacy operations, as well as medication processes and preparation. My experience in pharmaceuticals allows me to provide comprehensive information to the customers, ensuring the best in customer service. Assisted other pharmacy staff with drug inventory, purchasing and receiving. Compounded and repackaged medications, including unit doses, topical mediations and sterile products. Respectfully answered customer questions and helped locate desired items in the pharmacy. 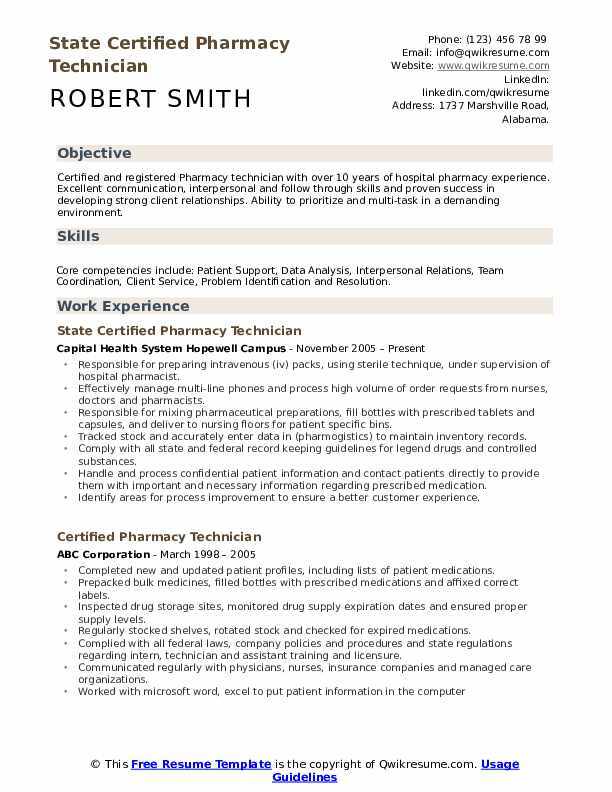 Objective : Pharmacy Technician with 10 years of retail and community pharmacy experience. Very energetic and motivated with excellent data entry skills and telephone etiquette. Detail-oriented and focused on customer service, accuracy, and efficiency. Received, verified and input customers prescription insurance data into the pharmacy's computer system. Established patient's medical history to ensure medications were safe from any adverse or allergic drug interactions. Counted/poured/weighed/measured and performed compounding/mixing of various medications. Removed and documented outdated medications; ordered depleted stock; processed and scrutinized incoming orders for accuracy. Priced/processed customer payments/copays and prepared insurance claim forms as needed. Calculated correct quantities/days supply and decoded sig code abbreviations for directions as per the institute for safe medical practices (ismp) format. Ensured patient files were up-to-date and accurate; organized and properly filed both paper and electronic prescription orders. Participated in continuous quality improvement (cqi) programs focused on reducing medication errors and made recommendations for precluding errors. Interfaced with physicians, insurance companies, and branch pharmacy locations to ensure validity of orders, verification of medical data, prescription availability, and transfers. Resolved an array of customer disputes regarding insurance coverage and educated customers on discount programs and other financial assistance resources. 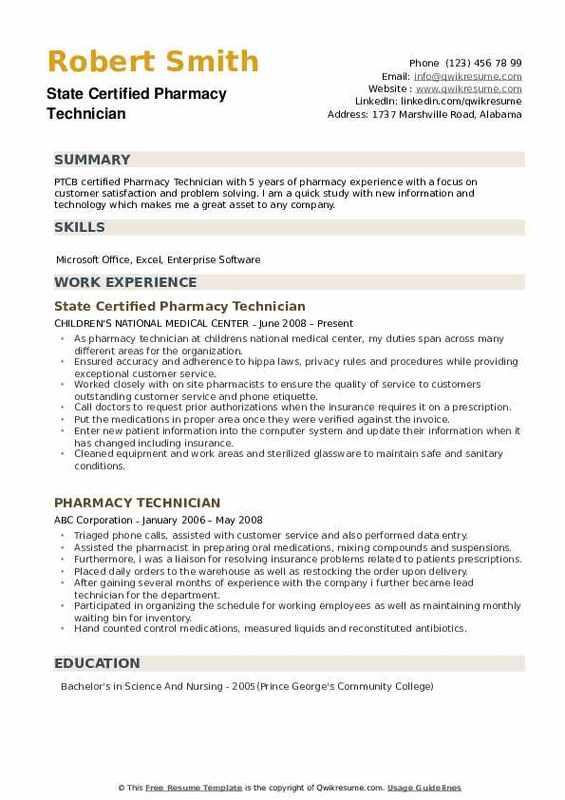 Headline : Pharmacy Technician with 7 years of hospital and retail pharmacy experience. 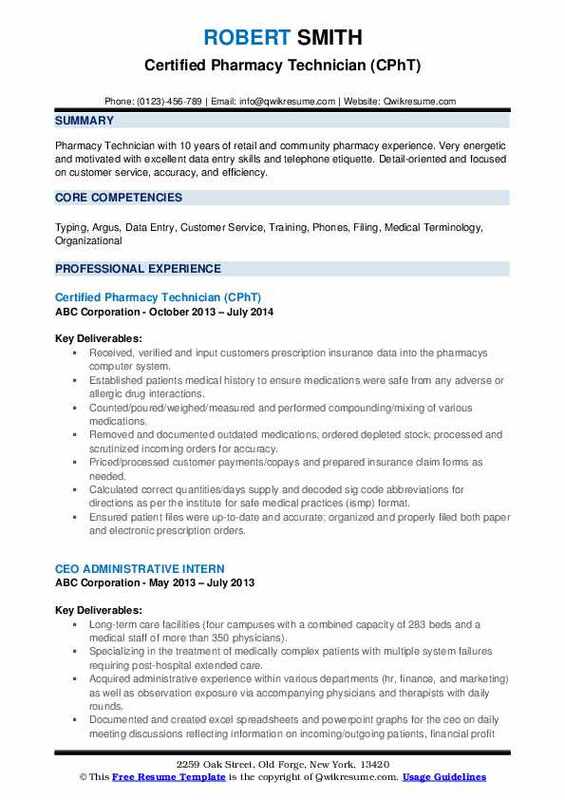 Self-starter with extensive knowledge of Medicaid and Medicare procedures, excellent data entry skills and telephone etiquette. Detail-oriented and focused on accuracy and efficiency. 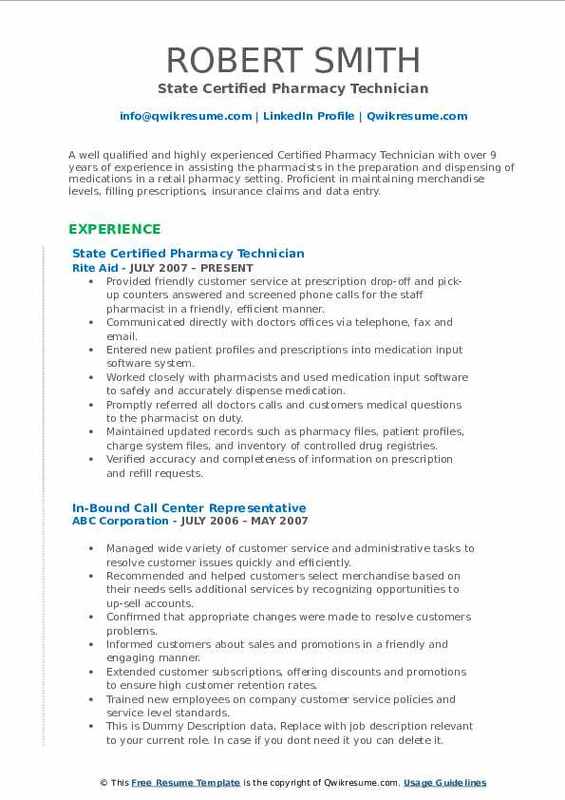 Responsible for multiple distribution areas inside this long term care pharmacy operation. Primarily responsible for re-packing bulk products into specialized unit dose packaging. Responsible for inputting drug information into the paxit software systematically preparing each day's workload so that production is accurate and more time efficient. Work daily with electro-mechanical equipment and electro-mechanical engineers, handling small repairs, material changes, and maintenance issues associated with the uhlmann unit dose packager and the paxit dispensers. Trained, organized and managed multiple new employees in both the uhlmann and paxit dispenser pharmacy department. Organized work plans for the unit dose packagers and the paxit dispensers to facilitate maximum performance output. Trained pharmacists in pharmacist verification utilizing the paxit manager system. 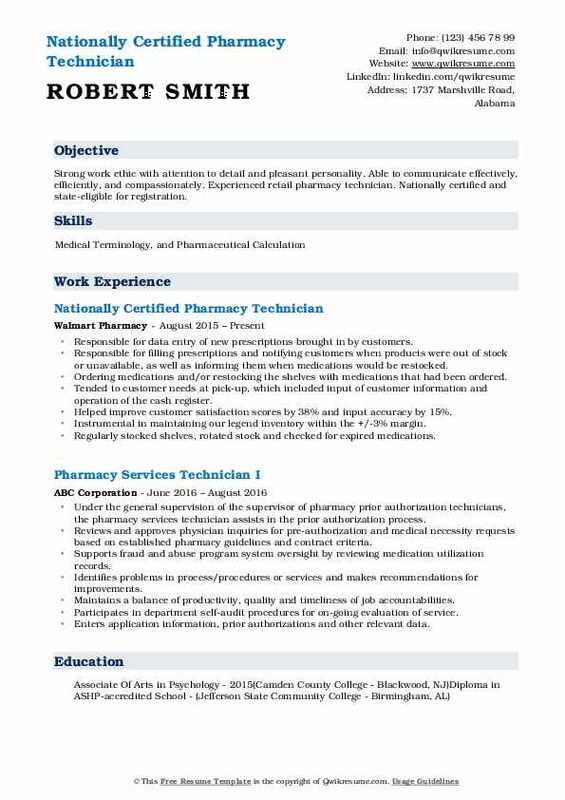 Summary : A well qualified and highly experienced Certified Pharmacy Technician with over 9 years of experience in assisting the pharmacists in the preparation and dispensing of medications in a retail pharmacy setting. Proficient in maintaining merchandise levels, filling prescriptions, insurance claims and data entry. Provided friendly customer service at prescription drop-off and pick-up counters answered and screened phone calls for the staff pharmacist in a friendly, efficient manner. Maintained updated records such as pharmacy files, patient profiles, charge system files, and inventory of controlled drug registries. Headline : I am looking to relocate and would like to have a job lined up before moving. I love working in Pharmacy as no two days as the same and helping people is something I also enjoy. I like to do challenging work and pharmacy billing and insurance companies seems to be my match. Trained new employees on how-to work in a pharmacy as well as register training and computer training for pharmaceuticals. Correctly process prescriptions, dispense medications, and fill prescriptions for pharmacists approval. Receive written prescription, refill requests and verify that information is complete and accurate. Receive and store incoming supplies, verify quantities against invoices, and inform supervisor of stock needs and shortages. Order, label, and stock medications, and supplies, and enter inventory data into computer. Partnered with management team to develop and implement in-store programs to increase sales. Objective : Strong work ethic with attention to detail and pleasant personality. Able to communicate effectively, efficiently, and compassionately. 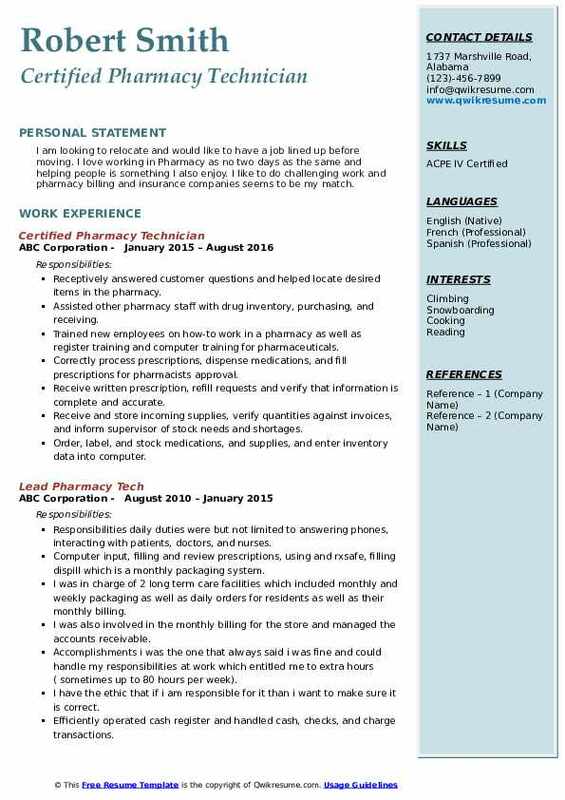 Experienced retail pharmacy technician. Nationally certified and state-eligible for registration. Responsible for data entry of new prescriptions brought in by customers. Responsible for filling prescriptions and notifying customers when products were out of stock or unavailable, as well as informing them when medications would be restocked. Ordering medications and/or restocking the shelves with medications that had been ordered. Tended to customer needs at pick-up, which included input of customer information and operation of the cash register. Helped improve customer satisfaction scores by 38% and input accuracy by 15%. Instrumental in maintaining our legend inventory within the +/-3% margin. Performed technical processes required to dispence medications to patients. Headline : I want to continue to learn new things as a Pharmacy Technician. I have not done any compounding or IV preparations and I would like to learn more in that area. The Healthcare system is always changing and improving and Pharmacy techs will be getting to learn more and do more and I am looking forward to the growth of the profession. 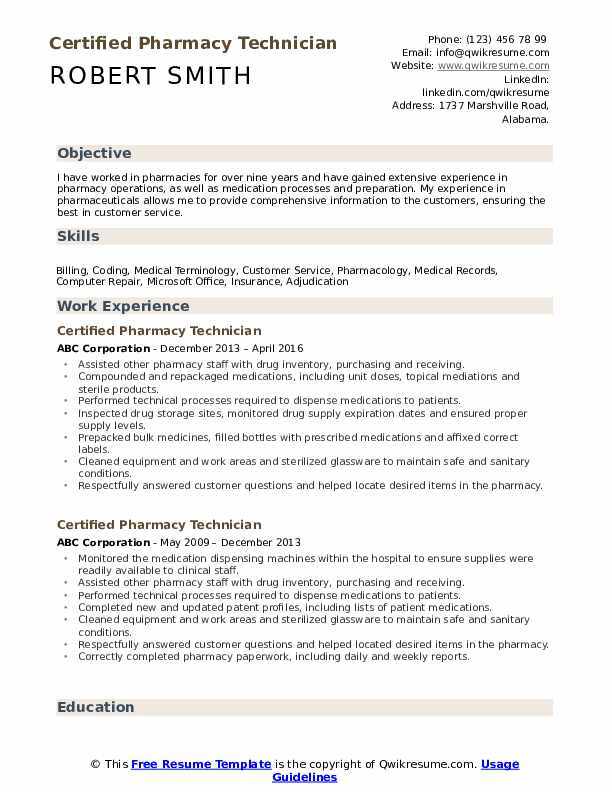 Skills : Pharmacy Technician, Customer Srevice, CPR/BLS Certified. Ensured and projected a clean and professional appearance, good work ethics, patient privacy, and proper communication with patients, superiors, and co-workers. Duties as a pharmacy technician included compounding medication as prescribed by the doctors, packaging of medication for shipment to associated clinics. Accepting delivery of bulk items or stocks, proper storage of medications and equipment as required. Instructing the patients about dosage of medication as prescribed by the doctors, cleaning of the facility to ensure a safe work environment. Preparation and delivering of prescribed medications, needed utensils such as needle and syringes, and nutritional supplements to patients diagnosed with life threating diseases such as hiv/aids and other stds, tuberculosis, seizures, and diabetes. Educating patients about proper dosage and care of prescribed medications, reiterate the doctors' comments as dictated by the doctors. Refill medications and request new prescriptions from doctors as needed, and lastly served as a liaison between the patients and the clinics, insurance companies, and the government. 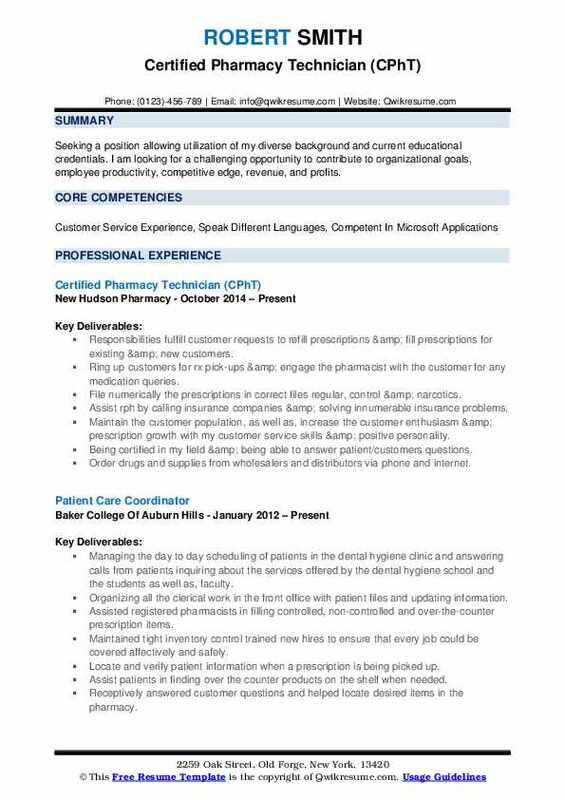 Summary : Certified Pharmacy Technician with excellent data entry skills and telephone etiquette. Detail-oriented and focused on accuracy and efficiency. Self starter and also a quick learner. Constantly improving work performance and knowledge on a daily basis no matter what the job entitles. Stocked shelves with medication when orders from the warehouse or mckesson had arrived in a timely manner. 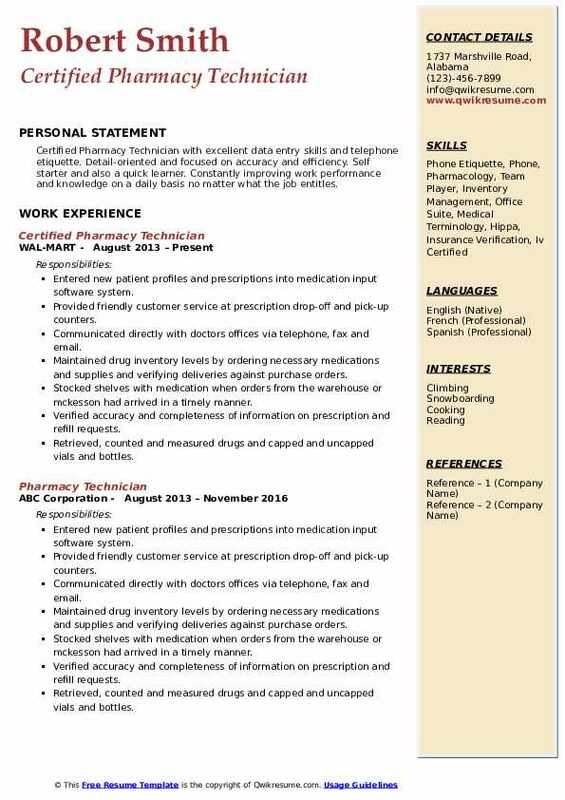 Headline : PTCB certified Pharmacy Technician with 5 years of pharmacy experience with a focus on customer satisfaction and problem solving. I am a quick study with new information and technology which makes me a great asset to any company. As pharmacy technician at children's national medical center, my duties span across many different areas for the organization. Ensured accuracy and adherence to hippa laws, privacy rules and procedures while providing exceptional customer service. Worked closely with on site pharmacists to ensure the quality of service to customers outstanding customer service and phone etiquette. Call doctors to request prior authorizations when the insurance requires it on a prescription. Put the medications in proper area once they were verified against the invoice. Enter new patient information into the computer system and update their information when it has changed including insurance. 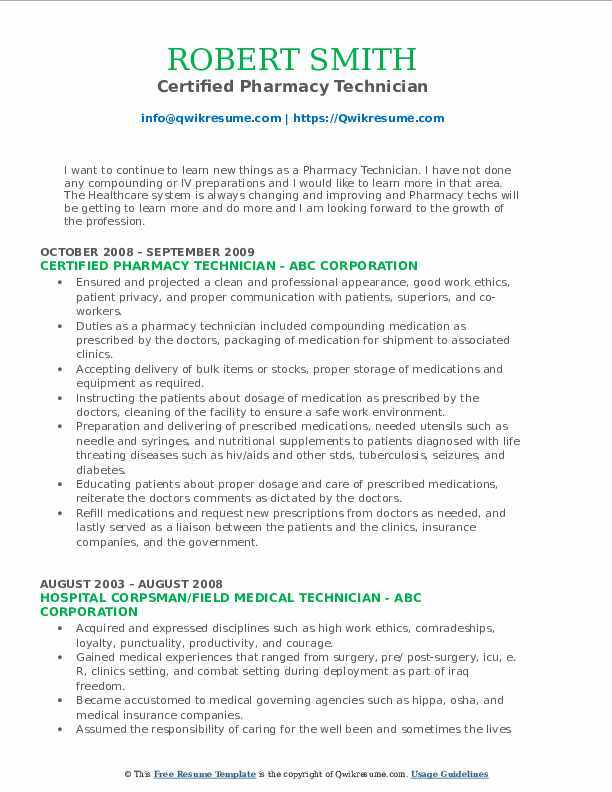 Objective : Certified and registered Pharmacy technician with over 10 years of hospital pharmacy experience. Excellent communication, interpersonal and follow through skills and proven success in developing strong client relationships. Ability to prioritize and multi-task in a demanding environment. Skills : Core competencies include: Patient Support, Data Analysis, Interpersonal Relations, Team Coordination, Client Service, Problem Identification and Resolution. Responsible for preparing intravenous (iv) packs, using sterile technique, under supervision of hospital pharmacist. Effectively manage multi-line phones and process high volume of order requests from nurses, doctors and pharmacists. Responsible for mixing pharmaceutical preparations, fill bottles with prescribed tablets and capsules, and deliver to nursing floors for patient specific bins. Tracked stock and accurately enter data in (pharmogistics) to maintain inventory records. Comply with all state and federal record keeping guidelines for legend drugs and controlled substances. Handle and process confidential patient information and contact patients directly to provide them with important and necessary information regarding prescribed medication. Identify areas for process improvement to ensure a better customer experience. Headline : Seeking a position allowing utilization of my diverse background and current educational credentials. I am looking for a challenging opportunity to contribute to organizational goals, employee productivity, competitive edge, revenue, and profits. Responsibilities fulfill customer requests to refill prescriptions & fill prescriptions for existing & new customers. Ring up customers for rx pick-ups & engage the pharmacist with the customer for any medication queries. File numerically the prescriptions in correct files: regular, control & narcotics. Assist rph by calling insurance companies & solving innumerable insurance problems. Maintain the customer population, as well as, increase the customer enthusiasm & prescription growth with my customer service skills & positive personality. Being certified in my field & being able to answer patient/customers questions. Order drugs and supplies from wholesalers and distributors via phone and internet. Experience with hyperformer, automix, pinnacle, repeater, acacia pump, and cpr computer system.